The volume of Middle Eastern and Asian investments into Russia’s commercial real estate market in 2015 will strongly depend on how fast the country’s financial market stabilizes. Asian investors may increase their investment in Russia’s real estate market to $500 mln in 2015 versus $445 mln in 2014, according to analysts at CBRE consultancy. The share of investment in this segment may thus surge from last year’s 14% to 20%, CBRE said in a report Tuesday. "Asian investors did not show noticeable systemic activity on the Russian commercial real estate market until 2014," the report said. "Closure of Western capital markets for Russian companies forced government and corporates to strengthen Eastern direction of development. These efforts brought their results and led to increasing interest of Asian investors to the Russian market," CBRE said. Acquisition by sovereign fund "Qatar Investment Authority" of Pokrovsky Hills Complex in Moscow became the landmark transaction of 2014 worth $400 mln. "The volume of Middle Eastern and Asian investments into Russia’s commercial real estate market in 2015 will strongly depend on how fast the country’s financial market stabilizes. We could expect rather restrained decisions from investors in a situation when credit interest rates in rubles exceed 20%, while Eurobonds yields total 6%. Guarantees to foreign investors provided at the governmental level may somehow improve the situation in this context," Anna Melnik, Head of Capital Markets Research, CBRE, Russia said. 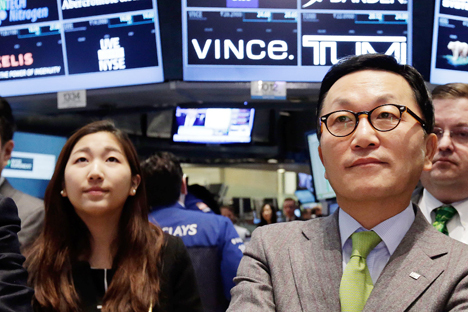 In 2015, experts expect Korean investors to increase their activity. At the beginning of the year, South Korea’s corporation Lotte Group acquired a hotel project nearby Isakievskaya square in Saint Petersburg for around 1.6 bln rubles ($25.5 mln), while additional investments in the project might exceed 1 bln rubles ($15.9 mln), CBRE said. Lotte also indicated the interest to one of the most popular Moscow shopping malls Atrium with gross building area above 100,000 square meters. Chinese investors discussed their participation in such large scale projects as redevelopment of ZIL industrial zone in Moscow, development of subway and residential and commercial real estate in New Moscow area and development of intermodal hubs in Vladivostok and Leningradsky region. Last month a multifunctional complex "Chinese business center Park Huamin" with gross building area around 100,000 square meters was started in Moscow. All in all, Asian investors deployed a total of $40 billion into international commercial real estate in 2014, a rise of 23% year on year, CBRE said. EMEA remains by some way the biggest centre for Asian outbound investment, attracting $13.7 billion (34%) of capital from the region in 2014. Across the board investor activity grew, with Singapore becoming the largest source of Asian capital, followed by China and Hong Kong, CBRE said. Taiwanese and Chinese insurers in particular grew their international real estate investment activities, by 770% and 310% respectively in the year. CBRE Group headquartered in Los Angeles, is the world’s largest commercial real estate services and investment firm (in terms of 2014 revenue).